Have you ever been the new girl? You show up to a room full of people who already know each other and let out an awkward "hello." Not always so fun. But what helps in situations like these is the people who take you in. That girl who invites you to sit with her, who introduces you to her friends, and who makes you feel like you belong. Ashely, aka 5ohwifey, has been that girl for many new bloggers, myself included. I'm pretty sure that I'm standing and Ashley is sitting. They don't call me pint-sized for nothing! So, Thursday, April 18, 2013, we invite YOU to get all passionate...er.. tell us where your passions lie outside of the blogosphere. And maybe make a few new friends. All you have to do is follow both of our blogs, post a button anywhere on your blog, and post a short vlog answering the following questions. You'll only have to link up on one of the host's blogs because our links will be interlinked. We really hope you join us. You can grab a button below to put up on your blog. Spread the word and lets get to know each other a little better! Here are the deets... feel free to make your video your own but please try to stick to these prompts and the time limit. What are your hobbies and passions that you might not talk about often on your blog? Is there a reason you shy away from sharing this passion on your blog? Loving your blog! 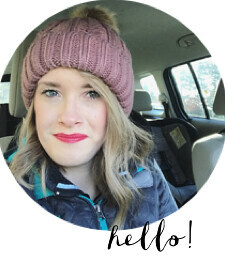 I'm visiting from 5ohwifey blog and am a new follower on bloglovin! I just basically went through all of your blog posts, and you are so cute and baby Nicholas is adorable! Looking forward to your next post! I'm thinking that I might do my first ever v-log and join in- I like this topic :) Do you just film it on your laptop and upload the video via blogger? Or do you upload it to youtube? You can do either! I personally always upload to youtube... I hope you join us! This is super exciting :) I've always (well, always since I started my blog, haha!) wanted to try this. Definitely gonna do this! I might join for the first time! Little nervous about vlogging though... eek! So true. Ashley had introduced me to so many friends through this linkup. Can't wait to join again! I'll be in Mexico so I think I'll finally record from there! yay! Even though I'm taking time off of writing, I'm definitley planning on doing this! This will be my first vlog ever! I can't wait to get to know what other blogger's non-blogging passions are. I have soooo been slipping on doing this link-up, but I hope to get back to it this week. No idea what I'm going to talk about though, lol.